Note that for Lite plans, History is only available for the past 30 days. All other plans include unlimited storage. 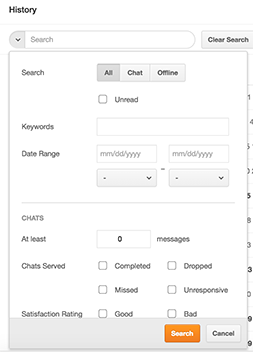 Enter a search term in the drop-down field to search for chats. Select the chats you want to export. Enter email addresses to send the CSV file to in the window that appears. Note that you can only export chat details to agents in the same account. The Recipients field is case sensitive so the email entered must exactly match the one listed on the agent's Chat profile. Click Send. The CSV file will be emailed to the addresses entered. How long is History available for Enterprise plans? I am also unable to find answer to this question. Zendesk will never delete your chat history when you're subscribed to a paid plan. History is available as long as you do not delete them. Please note, though, that once you delete a chat in History, there is no option to retrieve it. Why can't I search chat history by a customers email address if it was entered by the customer and is listed under the user info section? If you scroll down the advanced search dropdown, there is a 'Visitor Email' field you can use. To get the advanced search dropdown, click on the down arrow to the left of the search field. Why can Admins be the only role allowed to select and export chat History? This is really time consuming. Same question by Pedro Rodrigues. My agents need to export chat details daily in order to do some marketing actions and I'm the only one that can do that because I'm the Admin. It would be so much easy they could do it themselves. It would be great that "Export chats" was part of a custom role configuration. I just recently found out that the URL that's passed over in Chats is the first page a visitor lands on, not the page they actually started the chat from. In other words, if someone lands on our About Us page, and moves around for 10 minutes and then starts a Chat from our Sales page, we get the original About Us page! Sorry for any confusion. There isn't any native way to track the URL of where the Chat is Requested. But if you're looking an the exported CSV file from the history, the column on that file should just say "landing page" to avoid confusion. Currently, History is not supported in the mobile apps but the team are working on adding it as we speak and you should hear about the update in Q1 2019.